This started at the Vodafone Premier League fixtures at Ratu Cakobau Park in Nausori. 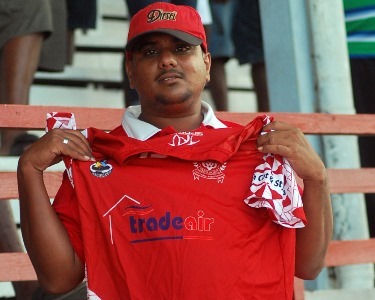 Rewa FA secretary Rohitesh Prasad said they were giving away souvenir jerseys to their fans that are supporting their home games. “This is an initiative from our president Nazeel Buksh to give away in return to our fans, “Prasad said. “We will be drawing the Vodafone Premier League ticket in all the matches played at Ratu Cakobau Park for Rewa. Prasad added that they will also be selling the Rewa souvenir jerseys and if fans wants to get one they can contact Rewa Football officials. “We have designed a souvenir jersey which we are selling and our fans can get one for very reasonable prize. Prasad said Rewa Football would like to thank its sponsor Lokia FoodCity and Trade Air for sponsoring the jersey. Last week, an ardent Rewa fan Varun Singh did the first draw for the jersey and he also received a souvenir jersey as a token of appreacitaion.